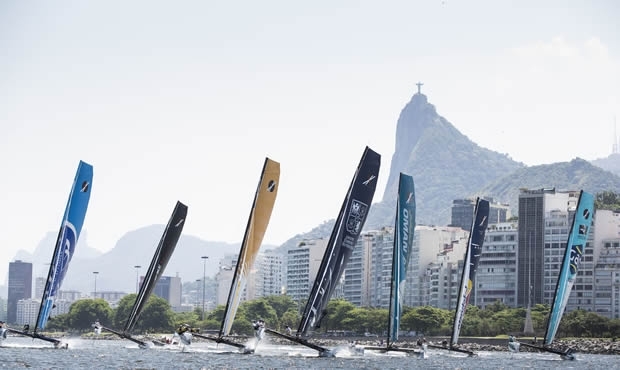 The final showdown of the 2012 Extreme Sailing Series kicked off today inside Rio de Janeiro harbour. With no wind out on the open water course the nine Extreme 40s immediately went into 'stadium' mode competing off Flamengo Beach with the magnificent backdrop of Sugarloaf Mountain and the Christ the Redeemer on statue. While Oman Sail's two teams are defending the top two spots on the overall 2012 Extreme Sailing Series leaderboard, Alinghi, with America's Cup and Lake Geneva specialist Pierre-Yves Jorand standing in for Ernesto Bertarelli on the helm, was star of the show today ending the day leading but level on points with the impeccible The Wave, Muscat, while Danes Jes Gram Hansen and Rasmus Koster's SAP Extreme Sailing Team put in a late charge, winning today's final two races. Six races were sailed in 12 knots of breeze with gusts of up to 18, under a brilliant Brazilian sun. A reaching start saw the teams power off the line for a short sprint to the first mark providing the spectators on the cable cars at the top of Sugar Loaf mountain with a spectacle. Pierre-Yves Jorand commented on their performance. “We had a good day the first day and were lucky enough to make some big gains in races two and three at the top mark which worked in our favour. We tried to take it easier and sail a smart way – not complicate things, take an easy approach and at the end it paid off”. It wasn’t all plain sailing today and there was a damage delay after almost every race – the worst of which came after a collision in race five at the first mark between Oman Air and Red Bull Sailing Team with the Austrians careering into the back of the Omani team. Down but not out, both teams made quick fixes on the water and were able to complete the final race of the day, but it was not the start either team were hoping for with the Series podium beckoning for both teams. Tonight will be a long night of crucial repairs for the shore teams as a despondent Larson explain: “It’s the third transom repair for Oman Air this year (Alinghi clipped it in training one time, The Wave, Muscat’s in Nice), but this is probably the worst. These guys (shore crew) are experienced at this and by 2 or 3 o’clock in the morning they will have it done. Tomorrow is another day – chin up, keep going. We are still in the hunt.” Both teams will be given a time penalty at the start of tomorrow’s first race for failing to avoid the collision. Brazilian national Olympic legend Torben Grael made his Extreme 40 debut today as the man in charge of wildcard entry Team Brasil and showed his medal winning pedigree leading his team to a second place finish in race four – no mean feat against a fleet that has been locked in irons against each other over the last 11 months of global touring. Erik Maris and his French team ZouLou had their strongest day of the Series, finishing the day in third place, joining Alinghi in a podium position for the first time this year. Tomorrow will see racing start at 1700 CET (1400 local time) with live video streaming including real-time 3-D visualisations and leaderboards from SAP for the first time and expert commentary from Richard Simmonds from 1700 UTC.